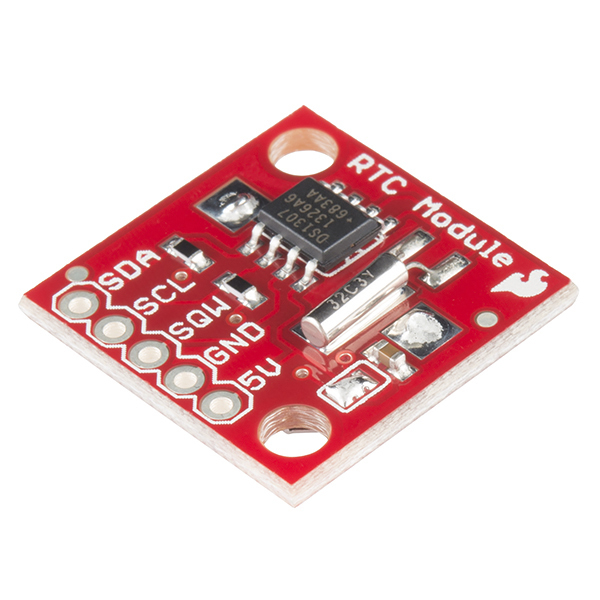 This is the SparkFun Real Time Clock (RTC) Module, this little breakout that uses the DS1307 to keep track of the current year, month, day as well as the current time. 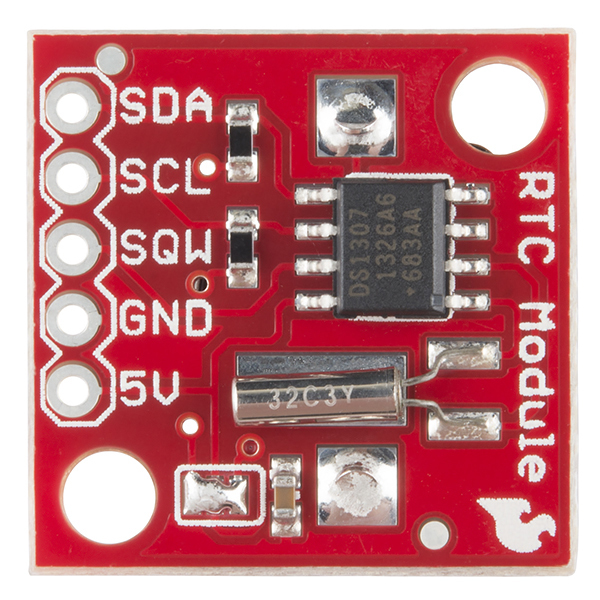 The module comes fully assembled and includes a small CR1225 Lithium coin cell battery that will run the RTC for a minimum of 9 years (17 years typical) without an external 5V power supply. The DS1307 RTC is accessed via the I2C protocol. We've written a test-bed to program the modules, this code should give you some insight on how to interface the module to any microcontroller using our example software I2C and BCD routines. This rev of the Real Time Clock module finally adds I2C resistors and a larger battery pad to fix the problems with the battery shorting to the board. Arduino Tutorial (Portuguese) Thanks Daniel Gonçalves! The supply voltage for the RTC DS1307 needs to have a 5V input so it is not directly compatible with a 3.3V device (like a 3.3V Arduino or a Raspberry Pi). You would need to do some modifications before being able to use it with a 3.3V system. You might be able to get away with just connecting the RTC to your 3.3V Arduino because of the open drain drivers => https://learn.sparkfun.com/tutorials/i2c#i2c-at-the-hardware-level . Otherwise, you might want to use a dedicated I2C logic level converter for the I2C pins => https://www.sparkfun.com/products/11955 . For the SQW pin, we recommend doing using a logic level converter https://www.sparkfun.com/products/12009 or voltage divider since the I/O of the Arduino is 3.3V. For a Raspberry Pi, you can remove the solder jumpers for the pull-up resistors so that you can just use the Raspberry Pi’s internal pull-up resistors. For the SQW pin, we recommend doing using a logic level converter https://www.sparkfun.com/products/12009 since the GPIO for the Raspberry Pi is 3.3V. Since I2C is open drain, can you run the SDA and SCL lines into 3.3v tolerant pins? I do plan on running VCC from a 5v power rail but do I need to level shift the SDA and SCL lines? Yes that should be fine. Avoid the SQW pin and you should be good. 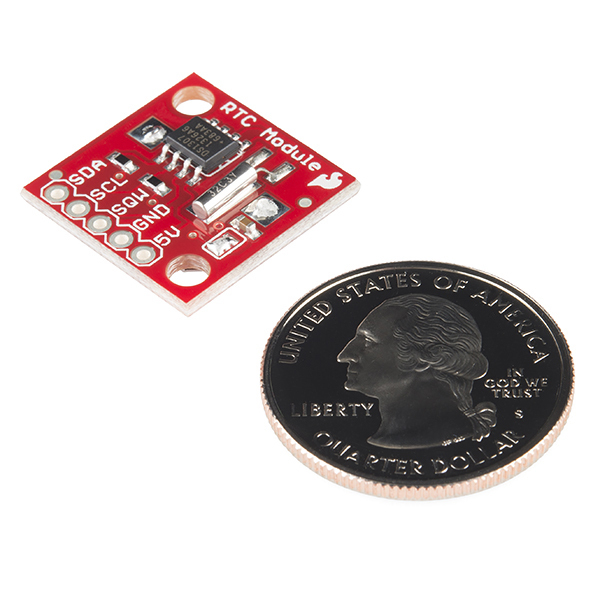 Um, not to be a sales person, but you might benefit from the new 3.3V RV-1305 based RTC? The DS1307 also gives weekday (Mon, Tues, etc); see the data sheet. I needed that for a sprinkler control system that operates in a district that allows sprinkling only on certain days. Hate to say it but ebay is MUCH cheaper. I didn't realize that these were 5 volt devices, but I figured since I was prototyping on an Uno I could get the systems working together and then worry about getting 3.3V components. I set it up so that this was running off of the Uno's 5V pin, and everything worked fine. Then I decided, "What the heck, I'll put it on 3.3V and see what happens". Apparently, it works ok - the time seemed correct - so I guess that's nice. The particularly strange part, though, is that the thing I'm working on is time-critical, so I had code timing my communication with the RTC. At 5V it took ~1060 microseconds, but with the RTC running off the 3.3V pin it took ~290 microseconds - more than 3x faster. I figure hey, the RTC has its own battery, maybe it's ignoring the 3.3V line and just using its internal reserves to talk? Nope, if you don't provide it with anything it'll refuse to chat. So that's weird I guess. The datasheet says that the min for Vcc should be 4.5V, but it actually seems to work faster at 3.3V. It might be slowly breaking on the inside or something. edit: aha, found the downside - when you cut power at 3.3V, the RTC forgets what time it was despite the backup battery being present and charged. There had to be a catch! For just 5 dollars more you can get an Arduino shield with the same (lousy) RTC, but with also a breadboarding area and SD socket at Adafruit. Maybe this breakout board could be made cheaper if you'd use the PCF85263A instead of the DS1307. New breakout board please! I found the more recent NXP PCF85263A, which is superior to the DS1307 in every way, yet costs 70% less! How about a breakout board for the 85263A? According to DS1307's datasheet, it needs a minimum voltage of 4.5V to work. How can a 3V battery (CR1225) work at all? Because the battery doesn't run the module. The battery is there just to keep time when the unit is powered off, but you can't communicate with the module at all when its just powered via the battery. How accurate is this chip over long periods of time? If I set it correctly now, how far can I expect it to have drifted after 6-12 months? The accuracy of an RTC depends on the crystal and load capacitors used, not the IC. The DS1307 has its load capacitors integrated, so there's no way of tuning it there, then everything depends on the crystal tolerance. A typical 20 ppm crystal will drift up to 2 seconds a day, or 1 minute a month(!). There are RTC ICs with calibration registers which let you tune the frequency, like the Microchip MCP7940 and the NXP 85263A, to name a few. I guess that a couple of seconds per month is possible, provided temperature doesn't vary much. The DS1307 can't be calibrated. Awesome! Just got mine in the mail! For some reason, it thought it was 2011, but I took out the battery and put it back in and it fixed the problem. Does this compensate for DST (Daylight Savings Time)? Is it possible to reset the clock to a different time? It does not compensate for U.S. DST or any other system. You are able to set the time to whatever you want and then the lock steps forward in minutes/hours/days/months/years automatically as time wears on. It's possible to set it to a random date in 2004 if that's what you send it. Is it possible to run this board at the 3.3v needed for a FLORA device? Possible yes. Reliable no, since you'll be operating the RTC out-of-spec. So it may work, but don't count on it. Most RTC ICs nowadays can operate from, say, 1.7V up to 5V. Maxim RTCs are exceptions. Is the 1 Hz square wave synced with the clock on the chip. I.E. Does the second roll over during the transition of the square wave? If I query the chip right before the 1 Hz pulse and right after. Will the seconds have incremented. I have looked through the datasheet and it is not clear on this. Does this module include the crystal oscillator? I see that sparkfun has a 32.768kHz crystal available for sale, but it is not listed in "Also Purchased" -------> so it doesn't appear that people are buying them with this module. Yes - it's a complete module built around the RTC and includes the board with all the components on it as shown. I confirm DS1307 work well on 3.3V GPIO with 1K pullup resistors on SDA/SCL, dont forget to unsold SJ2 jumper and supply 5V power. For information my board got 4.7K on SDA/SCL,it's too much and dont work well. START falling edge on SDA pin is not clear with 4.7K, with 1K signal is perfect on 3.3 V GPIO. So if I remove the solder jumpers on SDA/SCL it will bypass the pull up resistors. Could this then be used on a BBB using a 3.3v I2C bus instead of 5v (using the BBB pull-ups on the I2C clock and data pins)? Sorry for the nob question, but took so long to get a 'bone that I don't want to fry it by being a moron. which link specifically, they all work for me. I do live in the Central US, if that might somehow help, and ATT is my ISP. Yeah, their site is having issues. I would just check the Bildr tutorial instead, it's pretty good. The pad says 5V but the coin cell is 3V. Can I run this on 3.3VDC if everything else on the i2c bus is 3.3VDC? The coin cell does not power the unit. It only allows the device to keep track of time. Without the 5V you can not talk to the unit. I too would really like to know the answer to this. Also, if I use this with a Arduino Pro Mini 328 - 3.3V/8MHz and a LiPo battery how should I get 5v into this thing? Did you ever get it working off of 3.3v? Just ordered this device, I'll report back if I ever get around to trying 3.3V. That's bad advice: they're running the RTC far out-of-spec, i.e. correct operation can't be guaranteed, even if "it seems to work". Hi bronson, Did you ever get this to work at 3.3 by removing R1 and R2 pullups? Pre thx. why would you put the SQW right in the middle of 4 primary I2C pins? shouldnt it be on one of the ends? The schematic should help you derive that the two black components are 4.7kOhm resistors, the light brown one a 0.1uF capacitor, the crystal a common watch crystal (32.768kHz), and the description states "includes a small CR1225 Lithium coin cell battery". Sorry about that, all fixed now. Looks like the jumpers let you easily disengage the on-board I2C bus pull-up resistors. Preferred this over the "Dead On RTC", as the I2C is easier to connect than the SPI on the ICSP for the boards i use. The product worked as intended out of the box. The clock may have been programmed, but i didn't check. Piece of cake! Easy to use, I needed to set the clock too but it is easily accomplished with one line from RTClib (google it)! NOBODY told me you had to SET THE CLOCK !!!! There was a lot about it was set at the factory and would go for 17 years, but nothing about that I had to set the clock. I found it in an obscure tutorial on the use of PICAXE and the I2C serial communication protocol. Please note on your SPARKFUN data spec that the breakout board has to have the data SET with a HI2COUT instruction ! This module was exceptionally easy to hook up with an Arduino. Breakout board made it easy to test on a breadboard and then solder directly into the completed project. A minor improvement would be to add a non-connected hole and pad opposite the primary header holes to allow and additional header pin to be installed and make permanent installation onto another PCB sturdier. I recently got an email from SparkFun with a clock project using a DS1307 and 3 5V volt meters. It looked interesting so I built one. 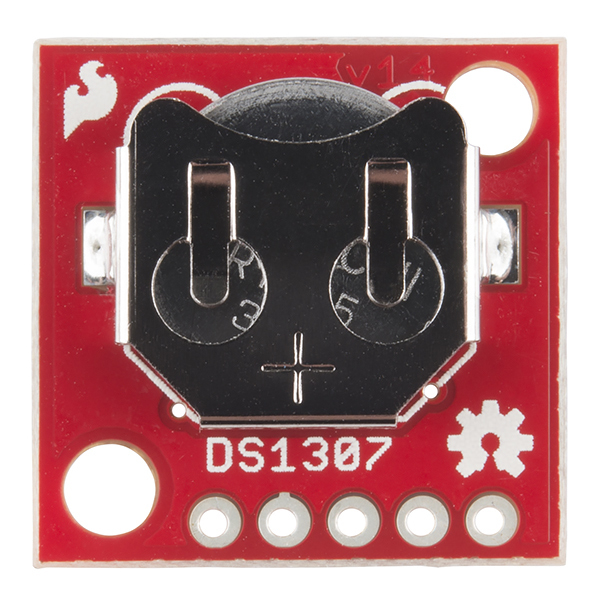 This DS1307 module is easy to use -- you just have to watch out for the 24 hr bug in the SparkFun DS1307 library, which I fixed in my GITHUB fork. It would also be nice if the library provided access to the DS1307's 56 bytes of battery backed ram, which I plan to add to my fork (because I want to use it). But the DS1307 module itself is great. In my case, the only problem was battery, it run fewer than expected. Really nice time keeping chip but requires some understanding from other websites. Worked right out of the box! All I had to do is solder on a header and unsolder the solder jumpers that pulled up the SDA and SCL to +5V since the Raspberry Pi I was connecting to already has pullups to +3.3V on-board. A bit of code, 4 wires to connect, and I could read and write the time registers to set and read the time. Very small RTC, which is great. Almost the smallest I've found. However, I'm designing a board that could use any available RTC. Adafruit, Ebay finds, etc. They mostly have similar pin configurations, except for this one. I'll have to include two header options, because the small size outweighs the inconvenience.